Loosen the soil and remove any weeds, competing roots and stones from the area you plan to plant. Plant the bulbs in groups of ten or more, and be sure to set the bulbs twice as deep as they’re tall, at least a couple of inches apart. Leaves will show up quickly. Just ignore them. Grape hyacinths send their leaves up out of the ground in the fall. This is strange because it’s just before winter comes and you would think they would not survive. Amazingly, they are very reliable every fall after the first year they grow. If you are wondering “do I prune grape hyacinths?” the answer is that you don’t have to. The plant will be fine if you do not. But if you want to neaten them up a little, that will not hurt the plant either. The grape hyacinth flower spikes don’t come until mid-spring. There may be some variation in color, depending on which ones you plant, but smoky blue is the most common color. Grape hyacinths don’t need a whole lot of care after they flower. They do fine with natural rainfall and don’t need fertilizer. Once their leaves die off, you can cut them back. In the fall, new leaves will grow, which will remind you of the pretty grape hyacinth flower to look forward to come spring once more. Grape hyacinths start from small fleshy little bulbs. Keep in mind that the small bulbs can dry out easier than the bigger ones, so plan on planting them early in the fall so they get enough moisture. Grape hyacinths grow in sun or light shade, so they’re not too picky. They just don’t like extremes, so don’t plant them where it’s too wet or too dry. 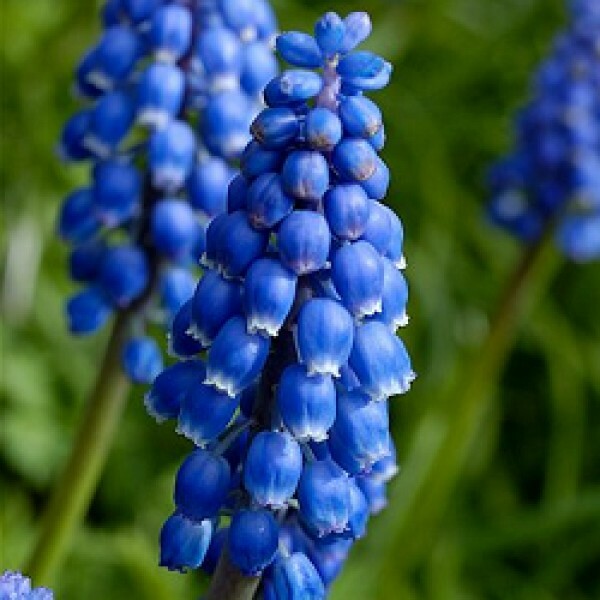 Be careful where you plant grape hyacinth bulbs because grape hyacinths spread very quickly. They can be quite invasive. You should plant them where you truly don’t mind them spreading freely, like under some shrubs, rather than say, around the edge of a well-planned garden area. Loosen the soil in your garden, and remove any weeds and stones from the area you plan to use. Dig a hole for a group of bulbs about 30cm wide and 10cm deep (a good rule is to put the bulbs about three times as deep as they are tall). Place the bulbs in the hole with the narrow part of the bulb facing the sky in groups of ten or more, at least 10cm apart. Carefully cover the loose soil over the bulbs and wait until the spring for some beautiful flowers.